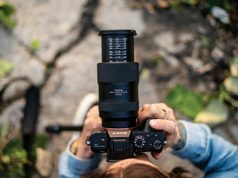 Photography has transformed over the years, and camera manufacturers have continued to rise to the occasion with form factors that appeal to the next generation as well as consumers wanting something that fits their style. Remaining flexible, and on the cutting edge, has led to a range of cameras that are distinct looking and also boast exceptional image quality. Let’s take a look at some of the current standouts in the field of cameras with a different shape. These unique imaging devices have form factors that defy traditional photo boundaries while providing enhanced functionality. With three cameras in the KeyMission line from Nikon, you will not only find unique form factors but cameras that are designed for specific photographic needs. 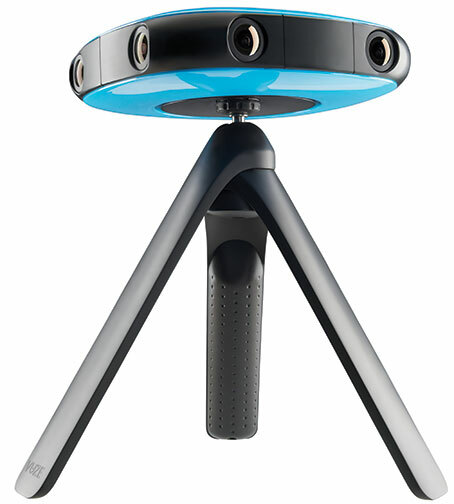 The nearly square KeyMission 360 delivers 360° video, capturing the scene in all directions simultaneously. Its smart device compatibility allows users to explore every point of view while instantly playing back what was captured. This “fit in the palm of a hand” imaging powerhouse is designed with dual lenses that protrude on either side. The lenses record all-around spherical 360° video in 4K Ultra HD. It also takes 23.9 megapixel photos. Given that it’s waterproof up to 100 feet without a housing, shockproof and freezeproof, the action camera can be taken in challenging environments without worry. The latest in Ricoh’s Theta series, the metallic gray Theta V echoes the line’s remote control-like body. 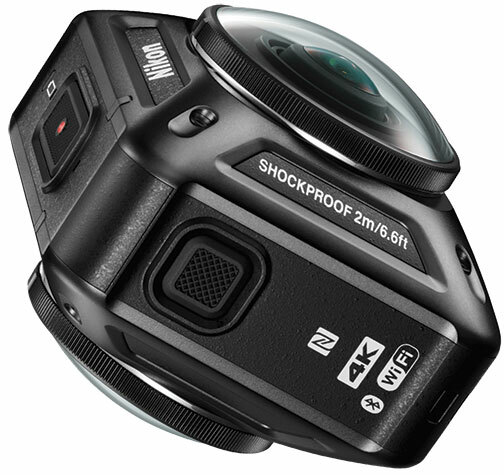 It is lightweight and easy to carry around, and it delivers 14MP still images as well as 360° 4K video. In addition, its 360° spatial audio capability enables users to record sound from all directions via a 4-channel mic for a more immersive experience. Not only is it styled like a small remote, it also acts like one with its remote control playback feature. 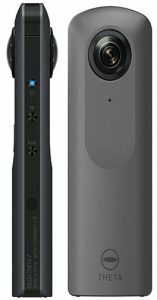 Users can display images and video on a monitor or TV while the Theta V functions as the remote control to select the image files, move 360° images up, down, left, right, and also zoom in and out. The stylish camera can connect to a smart device using either Bluetooth or wireless LAN for instant remote shooting. It can also receive firmware updates similar to high-end still cameras, and live stream 4K 360° video. 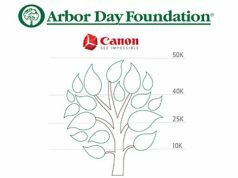 Pro-quality photography and video, even in low light, are obtained with high-sensitivity shooting from ISO 3,200 in still images to ISO 6,400 in videos and live streaming. And its new gyro acceleration sensor keeps the scene steady even when shooting on the move. The minimum shooting interval is 4 seconds for a greater range when creating time-lapse videos. The PixPro Orbit360 4K is engineered to easily capture and share 360º video. The super fun design incorporates a minimalist and stylish approach in an all-in-one, 360° VR (virtual reality) camera. 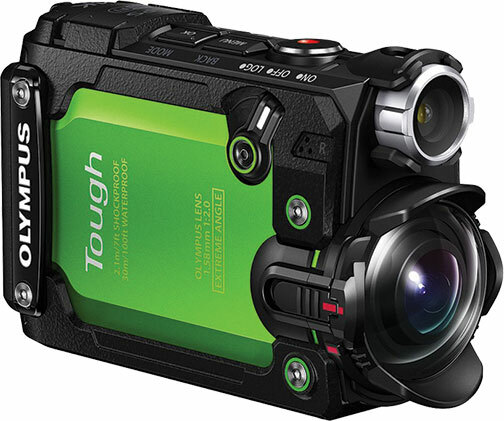 It boasts two 4K fixed-focus lenses mounted on both sides of the camera body. The lenses work in tandem to capture and automatically stitch together spherical 360° 4K video. Along with the cool form factor, it is an easy-to-operate, versatile camera that allows users to upload photos and videos to social media sites like Facebook and YouTube on the fly via a mobile app. The camera includes PixPro Editing and Stitching software, and useful camera accessories and mounts are offered in bundled kits. Plus, the dustproof, freezeproof, shockproof and splashproof body ensures users can take this camera on all of their exploits. 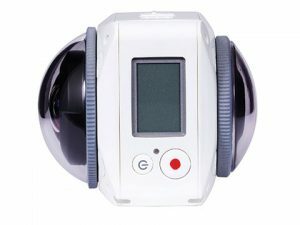 The Orbit360 4K features two 20MP CMOS sensors and uses a microSD card to record 360° photos and videos. It provides Wi-Fi and NFC compatibility for smart device apps to control and live view its feed remotely. If your customers are looking for professional-quality, virtual reality 3D 360° video and 3D audio at an accessible price, the Vuze delivers just that. Combined with the accompanying Humaneyes VR Studio software, it provides fully automated production and editing tools that deliver superb VR content. Prosumers, video and production industry professionals—and anyone wanting to create incredible stereoscopic VR videos and still pictures at the push of a button—will love this all-around camera that’s small enough to fit in a pocket and cool enough to show off. Its body resembles a tiny spaceship and comes in four different colors. Behind its sci-fi look is real tech. The Vuze boasts eight Full HD cameras that simultaneously capture dynamic 360° VR video or stills in stunning 4K. There are four internal microphones that create 3D audio for top-quality sound. One button operation, an integrated remote control via Wi-Fi, a mobile app for iOS and Android, and up to two hours of video capture on a single charge make this a versatile, simple-to-operate camera. Talk about a fashion statement! The charming Instax Mini 9 instant film camera is available in five super colors: flamingo pink, ice blue, lime green, cobalt blue and smoky white. This stylish point-and-shoot camera epitomizes the fun of instant photography, and adds modern features. It has as a selfie mirror, high-key mode and also an attachable close-up lens. 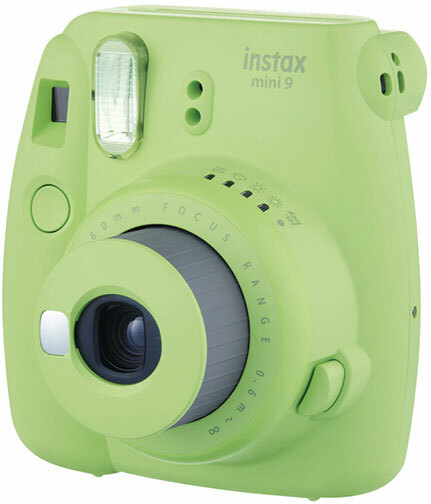 The Mini 9 not only has an attractive, yet funky, form factor, but it’s easy to use. It is also packed with features to deliver quality photos. The camera is built to make taking selfies easier than ever. It features a front-facing selfie mirror right next to the lens. There is also a lens for capturing high-quality macro photos. And a new high-key mode takes brighter pictures with more contrast. In addition, a built-in flash automatically adjusts to ambient light. Differing from its competitors, the Tough TG-Tracker is a pocket-size action cam that looks and feels like a mini camcorder with a twist. That twist is where the tough part comes in. It will keep up and deliver on any adventurous outing. Users can drop it, freeze it, crush it, roll it around in the dirt and even submerge it in water down to 100 feet—no housing needed. Adding to its unique form is a high-intensity LED headlight built right into the camera body. It assists in shooting in low light and can even be used as a stand-alone light. 4K Ultra HD video and time-lapse video is recorded using advanced Olympus optics. The camera also boasts some convenient features, like a tilt-out monitor to help capture difficult shots. Built-in action track sensors include temperature, barometric pressure, GPS, accelerometer and e.Compass. Along with Wi-Fi, they empower users to easily record and share adventures via a dedicated app. 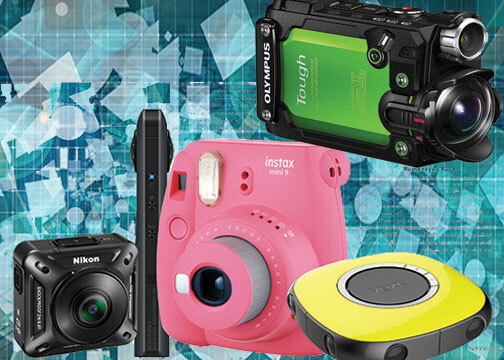 From capturing 360° photos and videos to delivering instant mini prints, today’s cameras sport form factors that are as diverse as the output they produce and the customers who are using them. Today, there is definitely a camera for everyone’s needs and style preference. It’s a far cry from the old box-style black and silver camera bodies of the past. Bright colors and sleek, innovative designs have taken the market by storm. Being able to market these distinctive imaging devices to the next generation is key. Take advantage of their unique shapes, colors and functions to fit the perfect picture-taking device to each customer and you’ll see success.